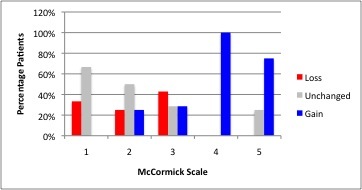 Muscle MEPs predict rehabilitation needs: Kothbauer et al. showed that a loss of greater than 50% of the amplitude of muscle MEPs during surgery as compared to amplitude at the time of skin incision predicts a significant decline in motor function during the postoperative period and that inpatient rehabilitation will be required (29). Sensory disabilities: Disabling alterations in sensation should be anticipated in all but the youngest of children who undergo this surgery. It will be an important issue during rehabilitation. 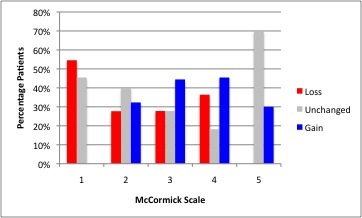 McCormick Scores: Constantini et al. (10) reviewed the outcomes of 164 children 6 months after surgery. Sensory dysesthesias: Dysesthesias largely improve over this time period, but sometimes persist. Medications and acupuncture can be helpful for this problem. 70% 5-year event-free survival: When 80% of the tumor was resected at surgery, Constantini and Epstein (9) reported a 70% 5-year event-free survival rate. Event-free survival did not improve with more aggressive surgeries. In other words, 80% resection equaled 100% resection with regard to event-free survival. Recurrence treatment success same: For the 30% who experienced recurrence, many were reoperated on with the incidence of functional decline and complications being essentially equal to those experienced by patients undergoing their first surgery. Functional status: Functional status was largely unchanged except when there was tumor progression. Below are scores of 116 of 164 children reviewed by Constantini et al. 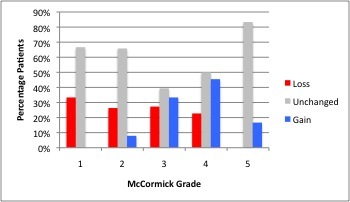 who had McCormick scores available at 5 years after surgery (10). 44 families of patients in Constantini’s series were contacted by the author in 2007, 10 or more years after their surgeries. 60% event-free survival: 6 had died because of disease recurrence, 12 had experienced disease recurrence. Slow improvement functionally: Those who experienced event-free survival had slow improvement in function. Below are their functional scores.